The budget for this film was $225 million. I wonder if any of it was spent on the script? The trailers had convinced me it would be my favorite super-hero movie of the summer – a bit dark, introspective, with the right combination of visual effects and human emotion. The trailers lied. The movie itself is choppy, contrived, sometimes hokey with a plot that takes at least half the movie to gain any traction – and then still keeps winding back on itself. The one question it does answer conclusively: What is the most complex and costly way to stage any sequence? There’s a lot of money foolishly spent, right up there on the screen. 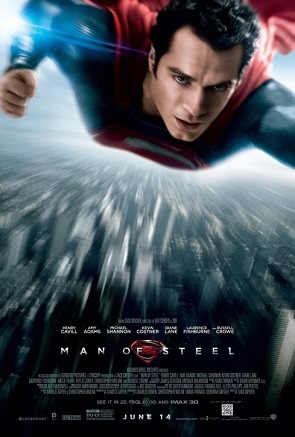 But, we can learn several things from a movie like this: a) Henry Cavill looks sensational without his shirt — in the next Superman movie, he should just wear the cape and tights; b) perhaps the reason Clark Kent returns home so often to see his mother is that she is played by Diane Lane; c) more people wanted to go to Earth with Kal-El, until they heard they would land in Kansas and have to live with Kevin Costner; and d) if you’re not going to have any humor in a movie, try not to have any chemistry between the lead characters, either. In a pivotal scene, Superman tells Lois Lane that ‘S’ stands for ‘hope.’ This proves that he cannot spell and so he must find something else to do that doesn’t require a good education. He decides to save the planet. That takes much, much longer than I expected.